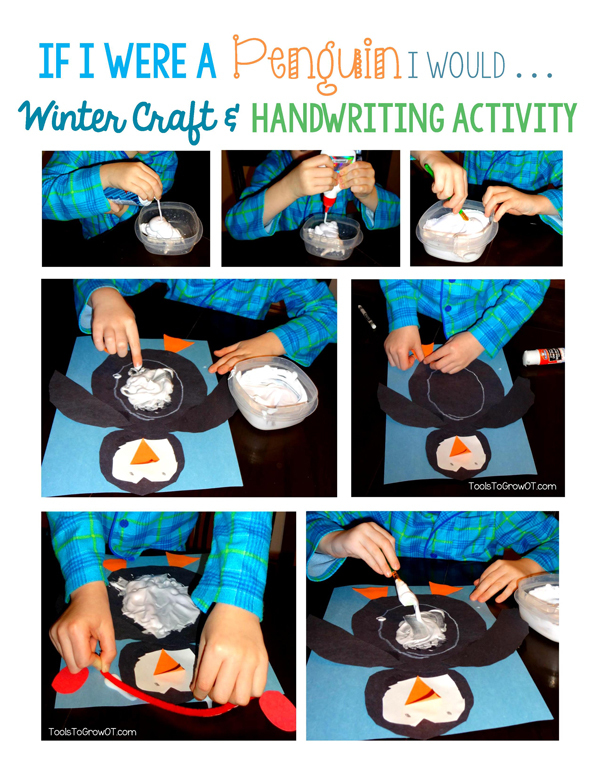 If I were a Penguin ... Winter Craft and Handwriting Activity | Blog | Tools To Grow, Inc.
Winter is officially here and we have a fun activity kids will love to make that addresses a variety of fine motor, bilateral coordination, visual motor integration, sensory processing, and handwriting skills. Occupational Therapists use clinical reasoning to design and implement therapeutic activities that target a variety of skills and utilize many strategies and modalities. These strategies involve doing as the primary mechanism for learning; which is known as using occupation as a means. "Occupation-as-means" is the use of a specific activities and tasks (intervention) to bring about a change or improvement in a client's performance and participation. The therapist must select an activity that is engaging, has meaning for the child, and has a purpose or goal. Occupational Therapists believe that individuals learn through experience, which includes thinking, feeling, and doing. According to the Occupational Therapy Practice Framework, this therapeutic use of occupations and activities includes the use of preparatory, purposeful, and occupation-based activities. In order to prepare the child for occupational performance, it may be necessary to begin with a preparatory activity. A preparatory method may include sensory input, therapeutic exercise, physical agent modalities, and/or orthotics/splinting. 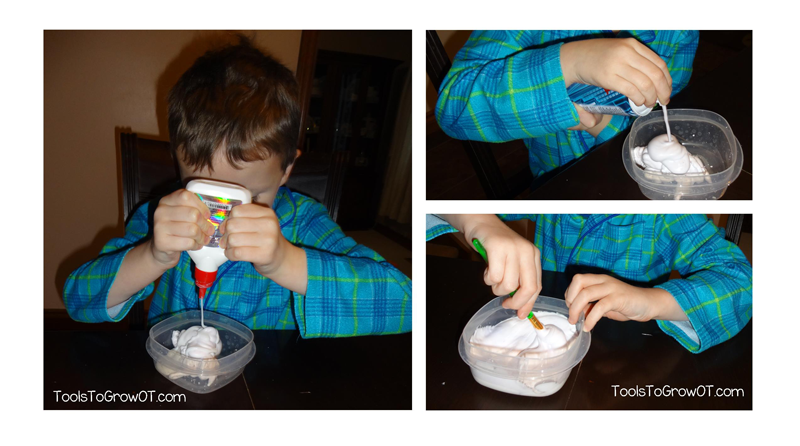 For this penguin activity it could be making the puffy paint by squeezing the glue bottle and shaving cream, or completing some self-regulation and calming strategies (see strategy ideas here). After this organizing of body functions, it is time to complete the activity or task. It is even better when the child has a finished product to keep! The uniqueness of Occupational Therapy is the use of this purposeful activity as intervention. Keeping the roots and foundation of our profession in mind, it is the use of this purposeful activity and the emphasis on doing as the primary mechanism for learning and relearning various skills. As Mary Reilly stated in her Eleanor Clarke Slagle lectureship, "Man, through the use of his hands as they are energized by mind and will, can influence the state of his own health." Tracing stencils is an important skill that requires the hands to perform different, but complementary actions. Using a stencil to trace various shapes will help a child improve his or her ability to use their vision to guide their hand. Cutting with scissors involves the skill of hand separation, fine motor coordination, bilateral coordination, and eye-hand coordination. Hand separation, a skill that is also required for handwriting, is when the thumb, index, and middle fingers separate from the rest of the hands. The production of legible and well-organized handwriting requires intact skills in the areas of postural control, eye hand coordination, visual perception, fine motor control, ocular control, and pencil grasp. A child’s handwriting capabilities have significant effect on their academic performance. This activity allows a child the opportunity to explore and create with their fingers and hands. "If I were a Penguin..." Handwriting Prompt - 2 Versions included! 1. Print out Penguin Pattern/Template on cardstock or heavy paper. 2. Cut out each individual part - the child will use these to trace. 3. Print out “If I were a PenguinI I Would ... ” handwriting prompt on cardstock or glue to heavy paper. 1. Print out FREE Printable Recipe here. 2. Mix the shaving cream and glue together in a bowl. 3. If the mixture appears too “thin”, add more glue to make it “stiffer”. 4. Once painted, projects will require several hours to dry. 1. Each child needs one “If I were a Penguin I Would …” writing prompt. 2. The child writes a response to the writing prompt. 3. 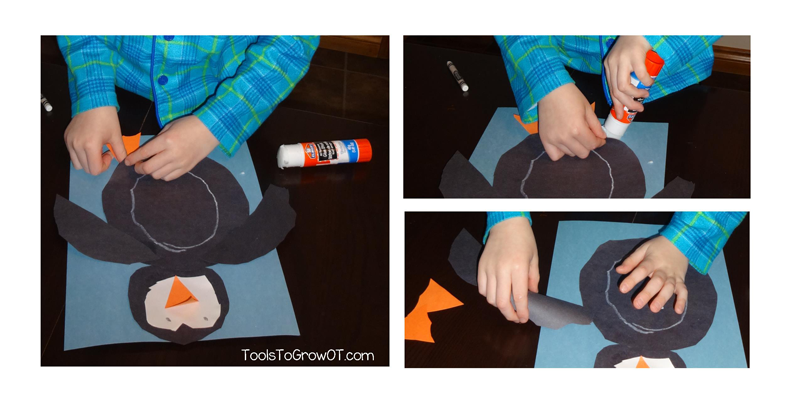 The child uses the stencils (pattern) to trace each part of the Penguin as indicated on colored construction paper. For example, the child would trace the flipper stencil two times on orange construction paper. 4. Cut out all pieces (adult may need to assist depending on skill level of child). Note: Use a white crayon or colored pencil to trace the penguin’s belly on the black body piece (this is where the puffy paint will go!). 5. Fold Beak in half and glue onto face. 7. Assemble and glue the pieces together on a full page of construction paper. 8. Connect ear muffs together with a pipe cleaner. 9. Draw eyes or use googly eyes & glue onto face. 10. Mix shaving cream and glue (see printable recipe) to create “puffy paint” for the Penguin’s tummy. 15. Glue assembled Penguin to the “If I were a Penguin I would ..” handwriting page. 16. Let assembled craft dry for several hours before hanging up. Some children may initially resist mixing the ingredients with their fingers. Allow them to use a spoon until he or she develops a tolerance. Some children may need to apply the mixture to the penguin with a paint brush. Gently entice your child to use the mixture as finger paint. Use cotton balls instead of puffy paint if child does not tolerate puffy paint. Pre-cut the materials for younger children to assemble. After the child has completed this activity, a fun closing/departing activity could be "penguin waddling" to put away the materials. 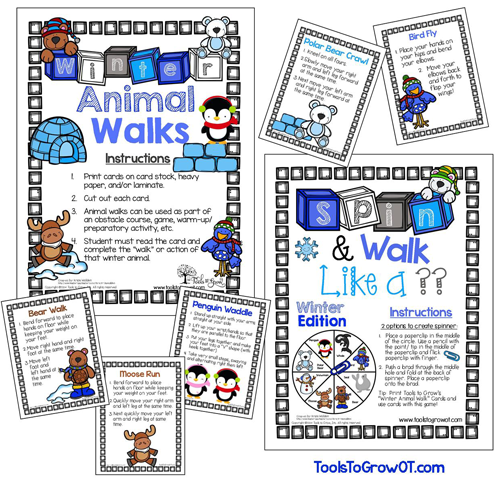 You can find this fun gross motor animal walk in our "Winter Animal Walk Cards" here. This set of 8 winter animal walk cards includes: waddle like a penguin, fly like a bird, crawl like a polar bear, run like a moose, and more! Included in this set of high quality PDF cards is a visual picture and written directions. Also try our new Winter Game "Spin & Walk Like a ....". We also have lots more animal and gross motor activities. Motor Planning Games can be found here and Animal Walks can be found here. 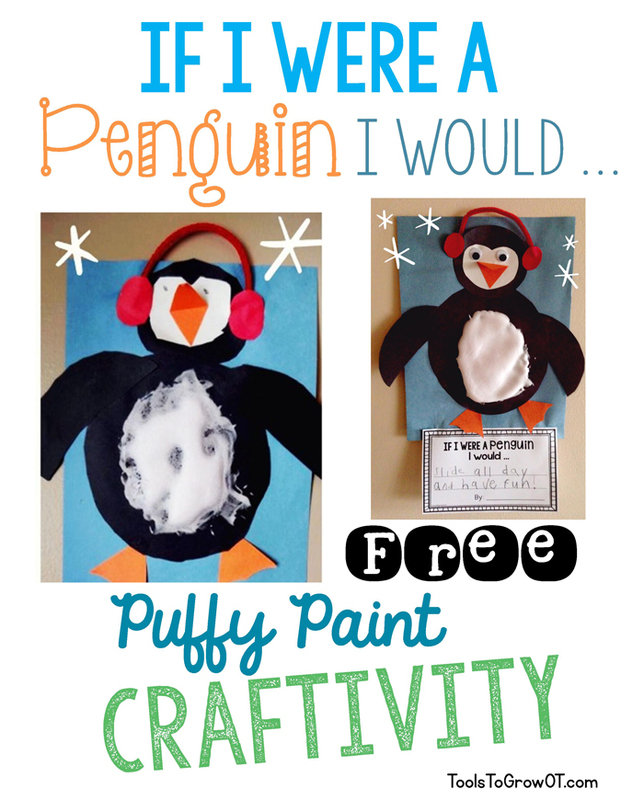 This "If I were a Penguin…" craftivity is sure to be "slides" of fun! We hope that this gets everyone in the winter spirit. You can find our FREE Penguin craft and handwriting activity here. Hussey, S. M., Sabonis-Chafee, B., & O’Brien, J. C. (2007). Introduction to occupational therapy (3rd edition). St. Louis, MO: Mosby Elsevier.